Yaaaaaaay!!!! It’s my birthday today! It’s my birthday today, yaaaaaay!!! Out of 365 days we are allowed one day to call ours. Please I crave your indulgence to be a bit immodest today. So I’m dedicating this whole page to myself. Yes, so I’m a year older today and a year wiser. I love the timing of my buffday…it coincides with Christmas and year ending. Like most other people, I always look forward to my birthday. It’s my few hours of enjoying the celebrity status, of accepting pleasant wishes from friends, acquaintances, and family. My best pictures have taken over some people’s dps and I’ve got a thousand birthday wishes on bb, facebook and twitter. Please don’t envy me, your turn will come…**winks. Anyway, I really looked forward to this my special day earnestly. I was up by midnight reminiscing about the wonderful blessings I enjoyed this year. I even took my time to count my blessings one after the other and guess what happened…my heart was filled with joy. I practically lay awake in my bed, smiling into the dark. I thanked God for keeping me alive and believe me there was a time I thought I would lose my life but I didn’t and I came out unhurt. I thanked God for my job and his faithfulness to me. I thanked God for my family, for making each of us to excel in our endeavours this year and for sustaining us. I thanked God for my relationships…I realized how much better my year was because of some people that were a part of it. In one way or the other, you all made positive impacts on my life. It may have been the simple smiles, the encouragement, the gifts, the help, the fun we had together, the calls, or merely the thought of someone being there for you. I feel so blessed today. When I awoke in the morning, the smile remained. The incessant calls that broke my 8 hours of pleasure sleep were all exciting to me. I didn’t even mind that my dearly beloved sleep was being interrupted. I was just happy. I also had a wonderful dream about my ‘dreams’ coming to pass. You can imagine how happy that has made me. It is my best gift yet. So, on this special day of mine and on this special page dedicated to myself, I wish to thank you for making my day by reading this. Femmetotale is special to me and I hope it becomes special to you too. Have a lovely day and enjoy the yuletide season. Remember to keep standing out. Happy bday love. Many more blessings and many more years to count them. 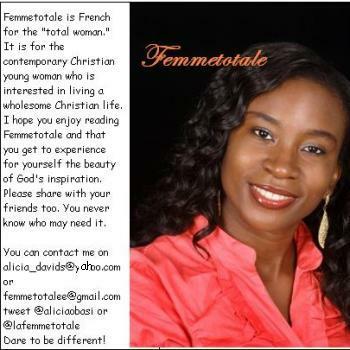 ….and Femme Totale is special to a whole lot of us dear. Hei Pastor M, thanx for your lovely birthday wishes. I just got to see them…and blushing now. Wishing you the best of the year!